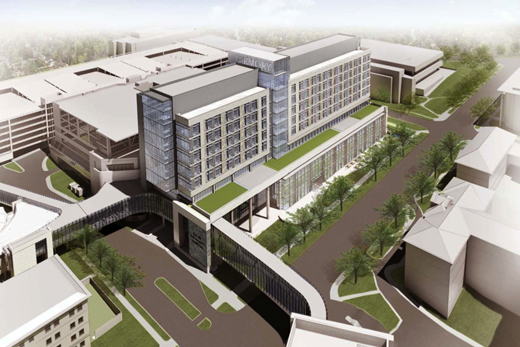 This rendering shows Clifton Road in front of Emory University Hospital's new J wing, which is under construction now. The Clifton Streetscape project includes widening the road and adjacent sidewalks, which will be separated from the street by landscaped buffers, among other improvements. As part of the hospital construction, a new, two-story pedestrian bridge will be installed over Clifton Road. CLICK TO ENLARGE: An aerial view of the section of Clifton Road that will be revamped through the Clifton Streetscape project. CLICK TO ENLARGE: This map shows Phase 1 of the 10-phase Clifton Streetscape project. Work will begin this month. By this time next year, Clifton Road will be a wide, tree-lined corridor welcoming students, faculty, staff, patients and other visitors to Emory University and Emory Healthcare facilities. Clifton Streetscape, a project to improve access, safety and aesthetics along Clifton Road, is slated to begin in mid-to-late June and continue until late spring/summer 2017. The extensive construction effort centers on Clifton Road from North Decatur Road to Haygood Drive/Eagle Row. It will include widening of the road and sidewalks, a bike lane, repaving of Clifton Road, new landscaping and improved visibility of intersections along Clifton Road. A separate project scheduled for this summer will construct a new pedestrian bridge over Clifton Road to connect Emory University Hospital's new J wing to the existing hospital, replacing the current bridge. Completion of the Clifton Streetscape will coincide with the summer 2017 opening of the new hospital wing. "While this work will impact all of our daily commutes, the end result will benefit our greater Emory community and enhance the experience of our patients, students and staff and their family members," says Matthew Early, Emory's vice president for Campus Services. The Clifton Streetscape project will make travel to Emory facilities both more efficient and more enjoyable, with improvements for vehicles, bicycles and pedestrians. An almost half-mile segment of Clifton Road will be resurfaced and widened, and a bike lane will be added along the east side. A "sharrow," or shared bike-vehicular lane, will remain on the west side of Clifton Road. Sidewalks will be widened to eight feet, with the addition of a five-foot planted strip along the curb, and trees and other plantings will be added to new medians. Streetlights similar to those at Emory Village and Emory Point will be installed as well. A new right-turn lane will be added at Clifton and North Decatur roads for westbound traffic headed toward Emory Village. A new traffic light and ingress/egress lanes also will be added at Healthgate Drive and North Decatur, where there is currently a gated, limited access entry near the North Decatur Building. This access point will be for use primarily by Emory University and Emory Healthcare faculty and staff who are accessing the parking decks along Gambrell Drive and is not intended for patients or through traffic. These and other changes will help "calm traffic; improve safety for pedestrians, cyclists and drivers; and generally improve traffic flow for all those who travel Clifton Road each day," says Al Herzog, program manager for Campus Services. He adds that Clifton Streetscape is consistent with urban design guidelines developed with Emory and the community several years ago by the Boston-based urban design firm Goody Clancy to provide a framework for more vibrant public areas on Clifton Road. As part of the hospital construction, a new, two-story pedestrian bridge will be installed over Clifton Road from the new J wing to Emory University Hospital, starting in July. Later, the existing bridge will be removed. Bridge installation will take place over a weekend and will necessitate restricted access to a portion of Clifton Road for that weekend. During that time, general traffic will be rerouted around the work site, and ambulances and emergency room visits will be accommodated. Both the bridge and Clifton Streetscape work will necessitate extended, periodic lane closures, although much of the road regrading and resurfacing work will be done at night and on weekends. An Emory team is dedicated to keeping the Emory community, patients, visitors and neighbors apprised of the work schedule and lane closures, Herzog says. Regular updates will appear in Emory Report and other publications. The CliftonStreetscape.com website will serve as an ongoing schedule resource.